In addition to the amber accord, a fougère accord is added for contrast. To achieve the amber note, a combination of vanilla, tonka bean, labdanum oil and patchouli was used. For the fougère aspect, there's geranium, vetiver, orange blossom, myrrh and musk. Finally, leather notes are softened with a blend of saffron oil and sandalwood. 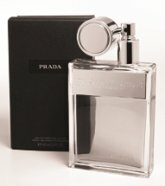 Update: see a review of Prada Amber Pour Homme, aka Prada Man. ...top notes of juicy pear, tangerine, grapefruit and black currant; a heart of freesia, lily of the valley and apple, and a drydown of cedarwood, sandalwood, praline, amber and musk. Betsey Johnson is an Eau de Parfum, and is available in 50 and 100 ml bottles and in matching body products. A men's counterpart is already in the works. Update: see the ad image for Betsey Johnson's scent here. Created by Ellen Molner of Givaudan, Polo Double Black is a fresh Oriental scent composed of top notes of mango and pepper, middle notes of roasted coffee and Indonesian nutmeg and bottom notes of rich woods along with cardamom and juniper berry spices. Ralph Lauren Polo Double Black is an Eau de Toilette, and will be in 75 and 125 ml. Etat Libre d'Orange is a new niche line that will launch in France this September with six unisex fragrances. The scents are: Jasmin et Cigarette, Encens & Bubblegum and Vraie Blonde, created by Antoine Maisondieu; Secretions Magnifiques and Je Suis Un Homme, created by Antoine Lie, and Putain des Palaces by Nathalie Feisthauer. Five more fragrances will follow in November. Spanish musician David Bisbal, "one of the most famous Latin singers", will launch his debut fragrance in Spain by the end of the year. So this company is making a line of unisex scents among which are “Je Suis Un Homme (“I Am A Man”), “Vraie Blonde” (“real blonde”, with the feminine-gender endings), and “Putain des Palaces” (“palace whore”)? Well, if that don't beat all. LOL — I didn't think of that, interesting. That Betsey Johnson smells a little tooooo cheap! Also, the bottle has too much goin on. I WANT HEIRESS PARIS HILTON!!!! I agree with you on the bottle. It's way over the top for me. >_< The scent wasn't particuarly good either. As it turns out, I didn't care for the BJ either.